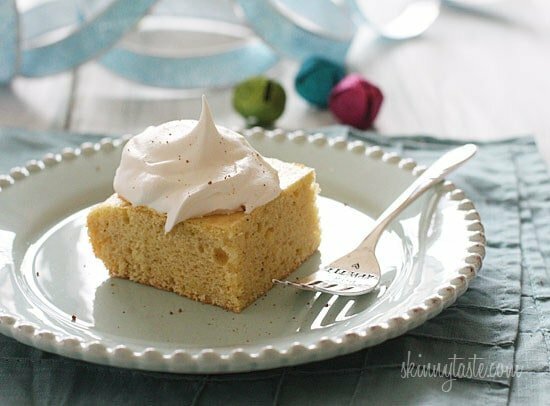 This skinny eggnog cake is so delicious. 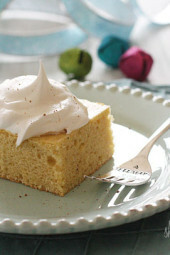 Simply combine a yellow box cake mix with nutmeg, Chobani, water, egg whites and you’ll have a perfect holiday dessert! 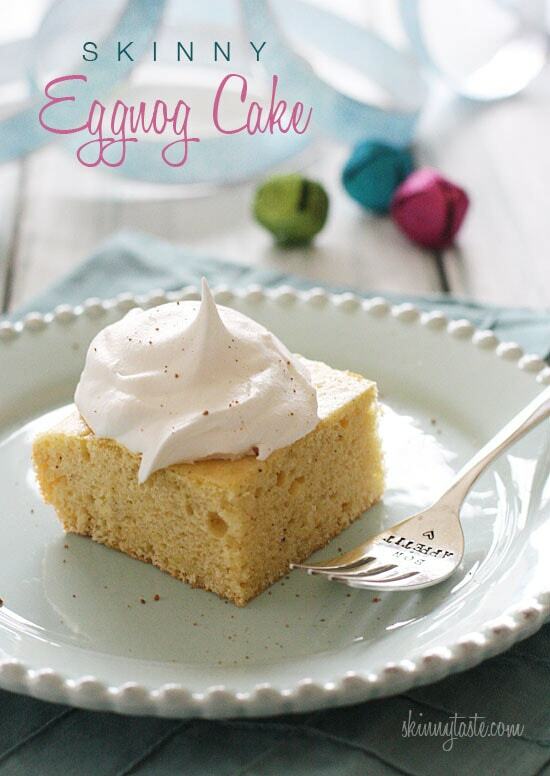 Top the cake with some whipped topping spiked with rum or rum extract and dessert is ready! A few other holiday cake favorites are Super Moist Carrot Cake with Cream Cheese Frosting, 5-Ingredient Almond Cake with Fresh Berries, and Easy Blueberry Buttermilk Cake. or GMOs. I heard Trader Joe’s also carries a similar whipped topping if you are lucky enough to have one near you. Happy Holidays!! Lightly spray a 9 x 13 inch baking pan with baking spray. Pour into prepared baking pan and bake about 28-30 minutes, or until a toothpick inserted comes out clean. 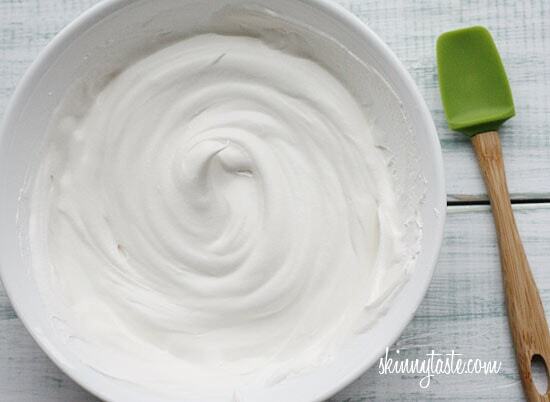 For frosting, in a small bowl, whisk whipped topping with rum or rum extract. Spread over cake and dust with more nutmeg. Keep refrigerated if making this ahead OR keep whipped topping in the refrigerator and serve on the side. Made mini cupcakes for christmas dessert and gifts for friends and neighbors. Sampled one before packing up and they are fantastic! Thanks for the recipe. PS Got my mom your cookbook for christmas. We ♡ you! I was really skeptical about doing the lightened up cake mix- it was my first time swapping the ingredients. I was so pleasantly surprised! The cake was light and moist and the cool whip was the perfect accompaniment. I made it for a Sunday family dinner and we all agreed it would be good with no spice and topped with plain cool whip and fresh strawberries instead- a lightened up strawberry shortcake! This is quite possibly the easiest dessert recipe I've ever made and it was delicious. I kept the cool whip on the side as I feared not everyone would be a fan of the rum flavoring. The cake was great on it's own as well as with the topping. Thanks for a great new effortless go to! Loved this recipe so much I decided to experiment with another flavor. I just tried a Chocolate Amaretto cake using your recipe but adding 1 tsp. of almond extract to the batter and eliminating the nutmeg. For the topping I added 1 Tbsp. of Amaretto to the whipped topping. Yum!!! I had 4 different parties to go to this holiday season and I made it for each party. It was always such a big hit and I kept getting asked for the recipe. I referred them back to your site. I used rum extract instead of rum for the whipped topping. I also couldn't find Truwhip so I used fat free cool whip and it was excellent. I just simply glazed the cake so I didn't use the entire container. The cake was so moist and light. I did need to cook the cake for 40 minutes in my oven but oven times vary so no big deal there. Thank you for another delicious recipe! This was SO GOOD! I made 2 to bring to numerous events on Christmas Day and they were a big hit. So yummy and super easy! First, I am a huge fan of eggnog. I love Bordens, but it is not WW friendly. I made this tonight. I used 1/2c Silk Nog and 1/2c water, and stirred 1Tbs Silk Nog into the Cool Whip as kids were eating it so did not want the rum. Flavor was really good. The cake came out a little tough. In 28 minutes it had completely pulled away from all 4 side of the pan by a lot, so I would guess over cooked? Also I find cake make with just whites tend to be tougher. Would make again, but cook less time. Any other suggestions? So happy you all liked it! Made this as cupcakes for Christmas Eve dessert and they were amazing! I made this and it's delicious. For the whipped topping I added in some Evan Williams egg nog (egg nog with whiskey in it) and it gave it a nice kick. Everyone loved it. This may be a new cake for Christmas. Thanks for the recipe its going to help me along my journey, Please check it out and encourage me while I lose weight on youtube. Could you make these as cupcakes without the topping? Maybe just serve the whipped topping on the side? I'm wondering how it might affect the points to take away the topping and make this as cupcakes instead. Thanks! Sure, I think it comes out to 3 points plus each as a cupcake with no topping. Just bought everything I need to try this! I'm not a fan of eggnog, but my family is & this looks yummy!!!! Hope I like it!!! What if I can't find truwhip? Use whatever whipped topping you prefer instead. Could you make cupcakes out of this? Just fill a cupcake tin with cupcake liners, cooking time will be less but same recipe. Looks delicious!!! Happy Holidays to you and your family!! Looks great! What is chobani? Mmmm…I'm looking for some good holiday desserts! I tend to bake a lot of cookies but want to mix it up this year! Super easy! Just the recipe I need to complete my holiday menu! Thanks! Would the sugar free yellow cake mix work for this? My dad's a diabetic but this looks like something fun to bring. no eggnog in the cake? Nutmeg in the cake, and rum spiked in the whipped cream. It's yummy!!! So fabulous. What a treat! This looks awesome! I'm thinking of replacing half of the water with light egg nog just to give that extra hint o' nog since it's the Mr's favorite. I was thinking the same thing! How did t work out? LOOKS YUMMY!!! Thanks Gina! A perfect light choice for our holiday. 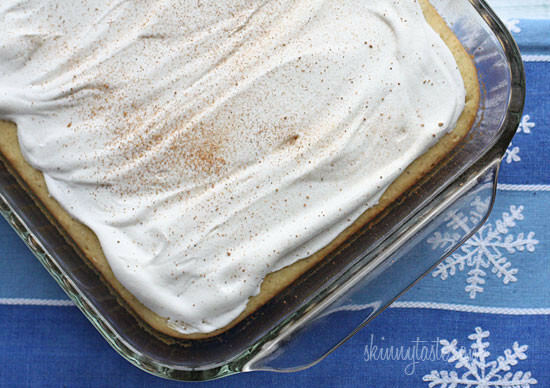 It's so hard to not fall apart during the holidays, but this recipe will definitely help!